So you wanted a smaller iPhone? You got it! 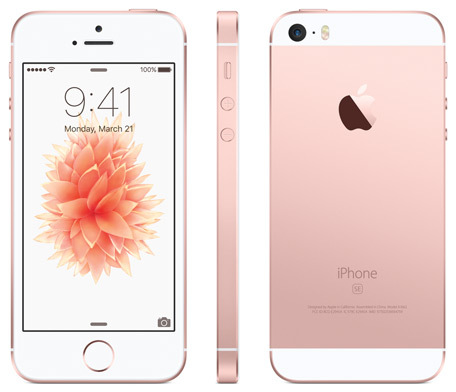 Last night, Apple announced the iPhone SE, a new 4-inch smartphone that offers a smaller (and cheaper) option to the company’s flagship iPhone 6S and 6S Plus. Even as the Cupertino-based firm calls it the most powerful 4-inch phone, we see it as a cross between the iPhone 5S (size) and the iPhone 6S (specs). In its ‘mini’ body, the SE holds the same 64-bit A9 chip together with the embedded M9 motion co-processor – the same engine that powers its iPhone 6s and iPhone 6s Plus flagship phones. It also sports the same 12MP iSight camera with Live Photos and the ability to shoot 4K video – and of course the now-famous Touch ID along with Apple Pay. All of this at a price-tag starting at $399 (Dh1,465) and topping out at $499 (Dh1,835). In the UAE, Apple says it will sell the device at a suggested retail price of Dh1,649 (16GB variant). And even as the UAE is among the second wave of countries to receive the device, residents will have to perhaps wait a week or so more than their peers in the first-wave countries. This suggests that Apple may have a clear handle on supply this time around (fingers-crossed). “iPhone SE is an exciting new idea — we started with a beloved, iconic design and reinvented it from the inside out. The result is the most beautiful and powerful phone with a four-inch display in the world,” said Philip Schiller, Apple’s senior vice president of Worldwide Marketing. iPhone SE will be available in space gray, silver, gold and rose gold metallic finishes in 16GB and 64GB models starting at $399 (US) from Apple’s retail stores, Apple.com, Apple Authorized Resellers and select carriers, or for 24 monthly payments starting at $17 (US) exclusively at Apple’s retail stores in the US. iPhone SE will be available in early April in another 46 countries, including the UAE. These are: Albania, Andorra, Austria, Bahrain, Belgium, Bosnia, Bulgaria, Croatia, Czech Republic, Denmark, Estonia, Finland, Greece, Guernsey, Jersey, Hungary, Iceland, India, Ireland, Isle of Man, Italy, Kosovo, Kuwait, Latvia, Liechtenstein, Lithuania, Luxembourg, Macedonia, Maldives, Malta, Monaco, Netherlands, Norway, Poland, Portugal, Romania, Russia, Saudi Arabia, Slovakia, Slovenia, Spain, Sweden, Switzerland, Taiwan, Turkey and UAE. As part of the newly-announced Trade Up with Installments program at Apple stores in the US, customers can also purchase iPhone SE for as low as $10/month for 24 months.